I’m here to talk about this outfit. Or to show you what I wear when life gets too busy and my brain is too overloaded to put much effort into an outfit. I’m wearing tried and tested old friends: the only pair of jeans I could find in my really messy wardrobe (I did mention it’s been a bit busy lately, didn’t I? 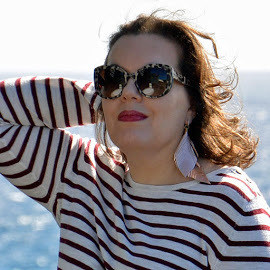 ), one of my ubiquitous striped tops, and an old coat that I’ve featured so many times that I can’t even remember, and one of my many silk scarves. 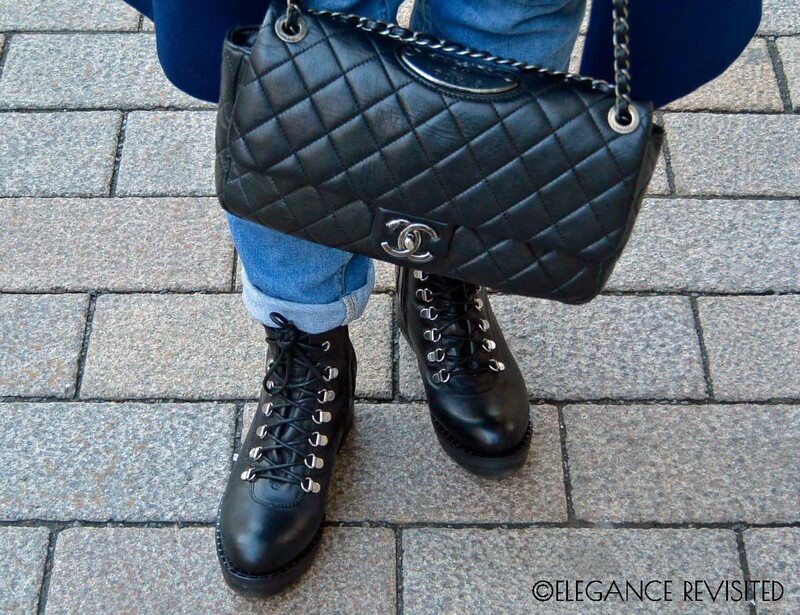 And the Chanel bag that doesn’t get taken out for a stroll often enough (because my weekday look requires me to carry a huge bag to lug around all the work stuff…). THE SHOES ARE BRAND NEW! Well, I bought them a month ago but haven’t worn them yet (I got them for winter: no doubt I’ll have plenty of occasions to wear them in the coming months…). What do you wear when life gets busy? I can relate to that… In my case, being busy is always seasonal: I have either way too much work or too little. The coordinating blues are so pretty. 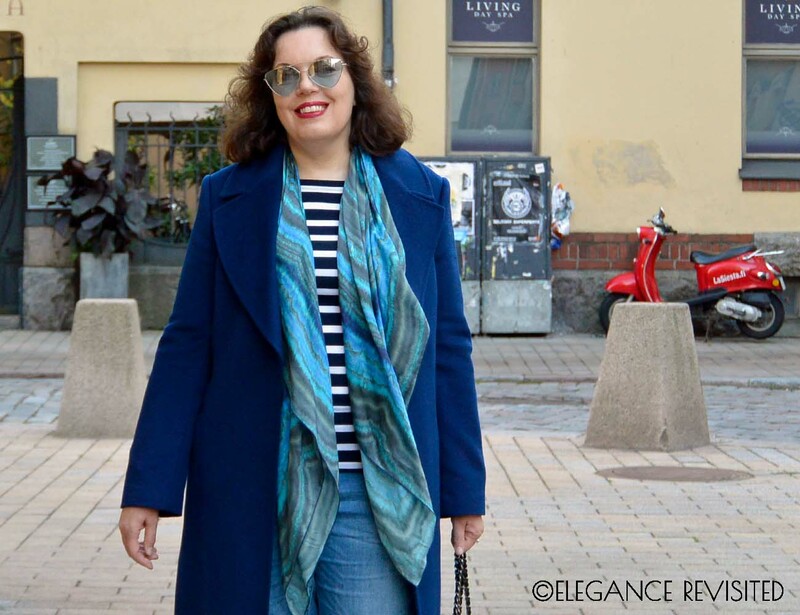 In my book, you can toss a scarf over about anything and look tres chic! I need to get a striped shirt! Thank you! well, a scarf is such a practical item, isn’t it? It keeps your neck warm and can add some colour to the outfit, what’s not to like? Love your outfit! It’s my style! I like all the blue tones too. You always look very put together. Thank you, Arlene! Trust me, I don’t always feel very put together. 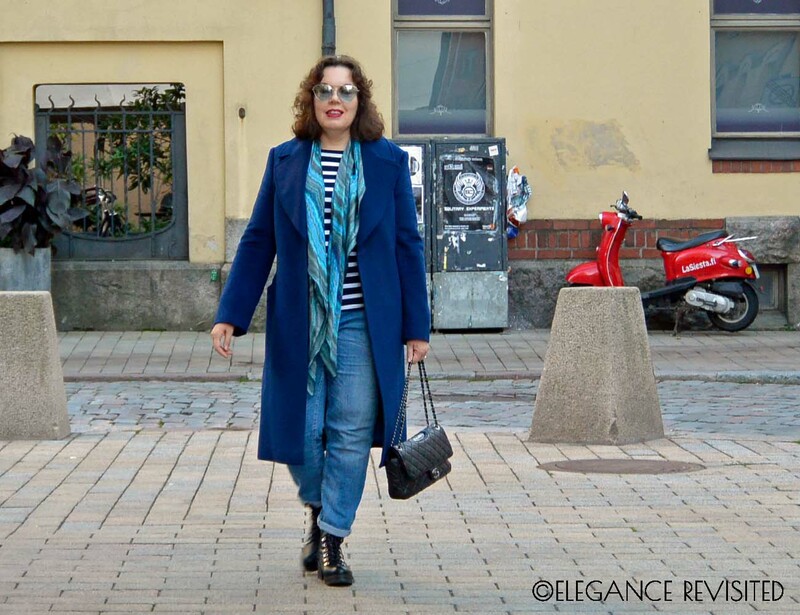 Love the aqua blue scarf with your cobalt coat.. very eye catching! Beautiful bag, of course and those are some sweet booties! Love the style! lovely accessorizing, fabulous shoes and really cool color combo!. I think that you did a great job looking fab even in busy days. 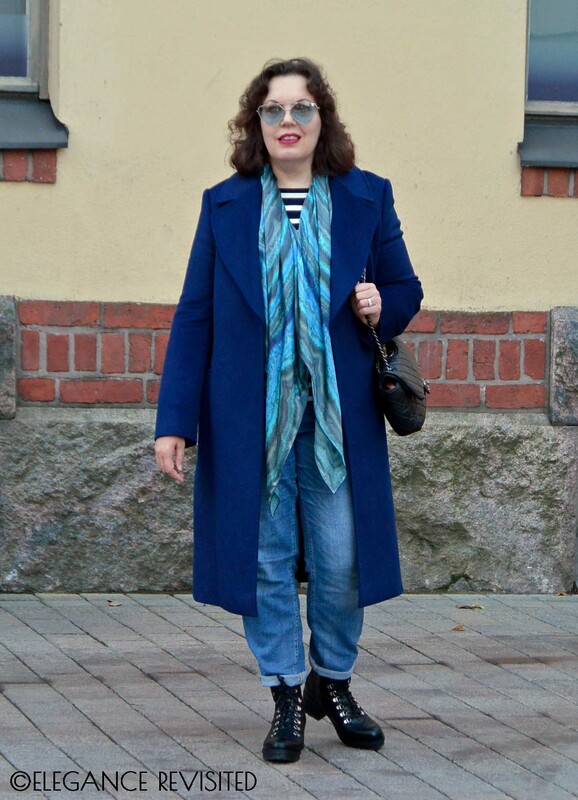 You totally rock in your striped t-shirt, jeans and cool coat ensemble! Your boots are so fab! 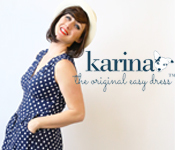 I can totally relate to your dilemma – I’m a freelancer too and the last couple of weeks have been crazy busy. I have a few outfits that I wear on repeat when I’m short on time and inspiration. A smart coat and a classic bag elevates any outfit. 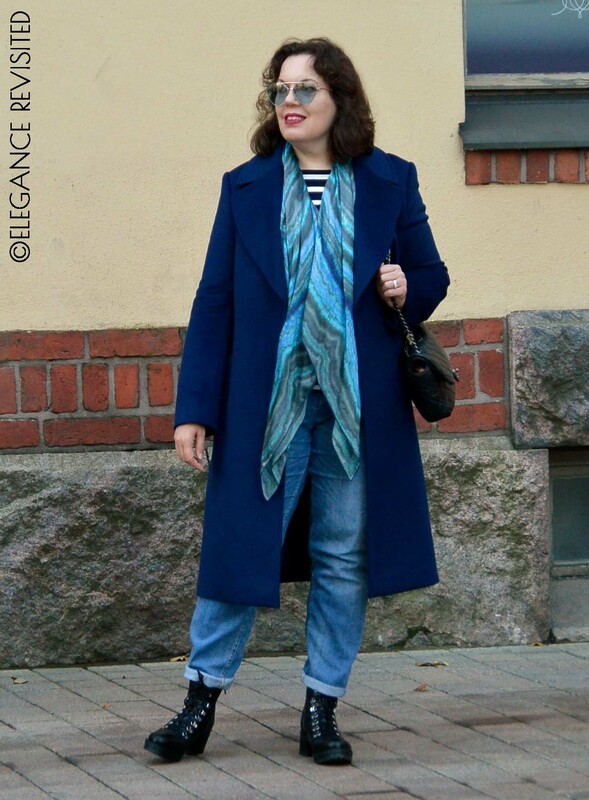 I love your new boots, they add an edgy vibe to a classic outfit.Thanks for linking up! Your boots are right up my alley! I had a pair many, many years ago – I completely wore them out. I’ve been searching for a replacement ever since (but no luck with my crazy sized feet). I bet you’re going to wear them with everything this winter! The coat is so good. A classic but not boring colour that never ages, just perfect with those über cool glasses!